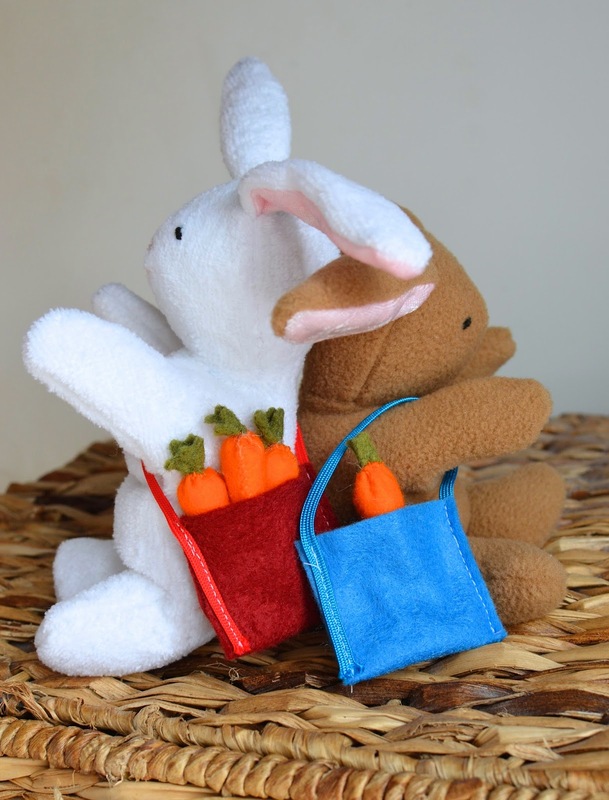 ikat bag: Catch my Flat Bunnies on Sew Mama Sew! So, this is how long it takes me to make something. 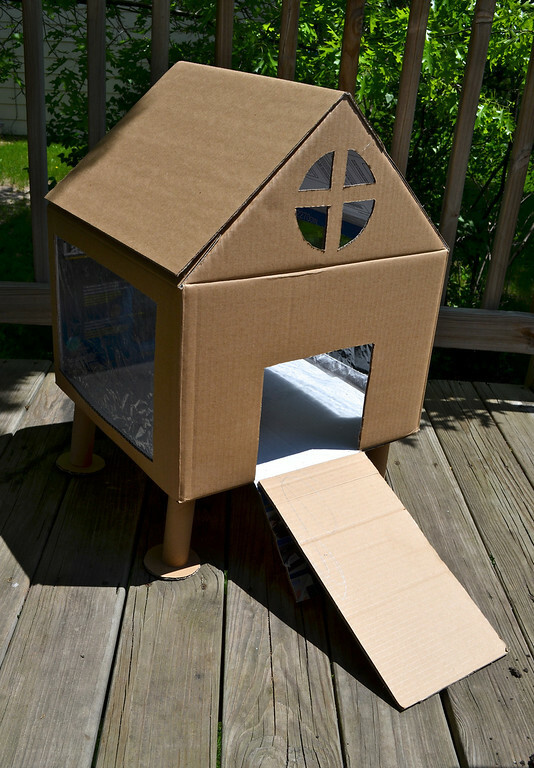 Long, long ago, in the year 2011, we made a cardboard hutch. 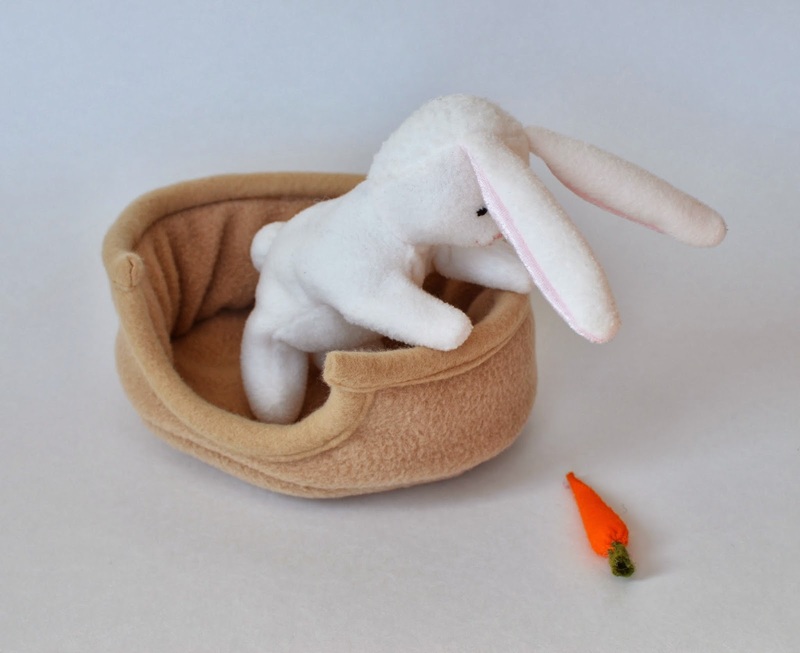 And I started to make a baby bunny for the hutch, roughly based on an old softie we had in the house. 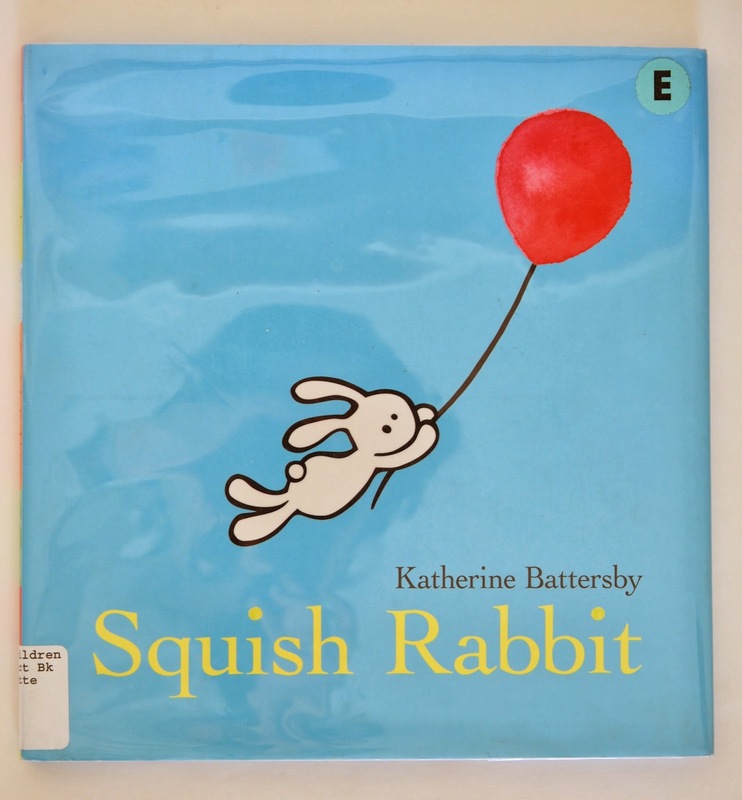 Kate, once devoted to all things snow leopard and puppies, inexplicably developed a deep and abiding love of bunnies. 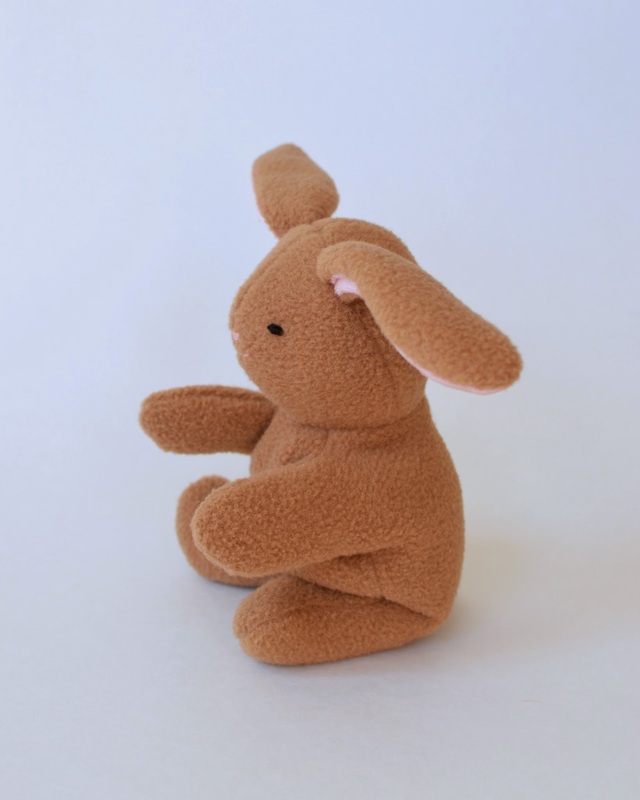 Which she divided into two species: Flat Bunnies (which lay on their bellies like bearskin rugs) and Puffy Bunnies (which sat on their bottoms like teddy bears). 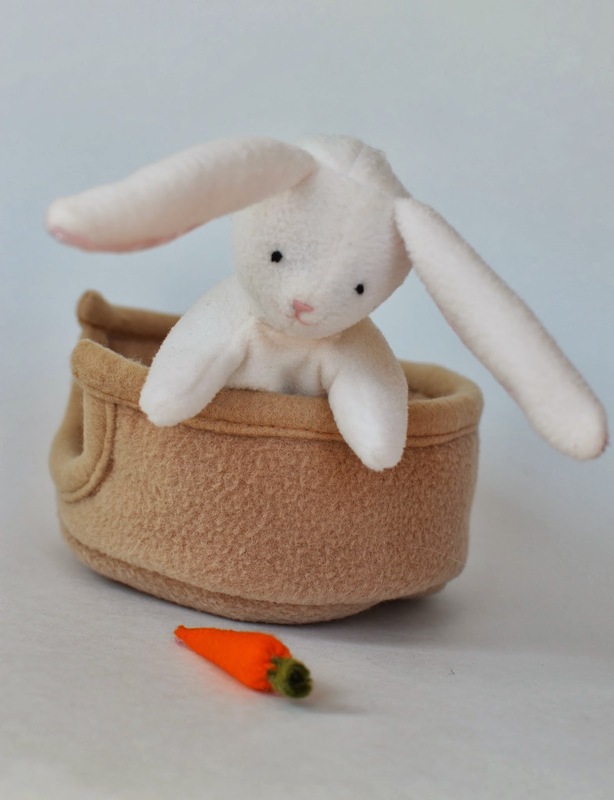 And for her birthday last year, she requested a Puffy Bunny. Which she got. And the world was at peace. 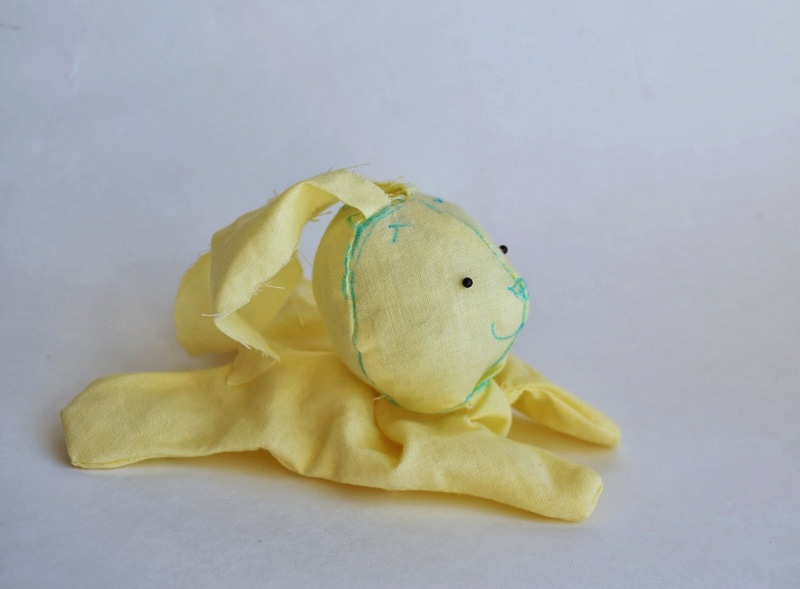 and Squish, the rabbit, reminded me so much of that forgotten bunny muslin from eons past that I decided to resurrect and finish him. I found the softest microfleece scarves on clearance (50 cents!) and cut them up. 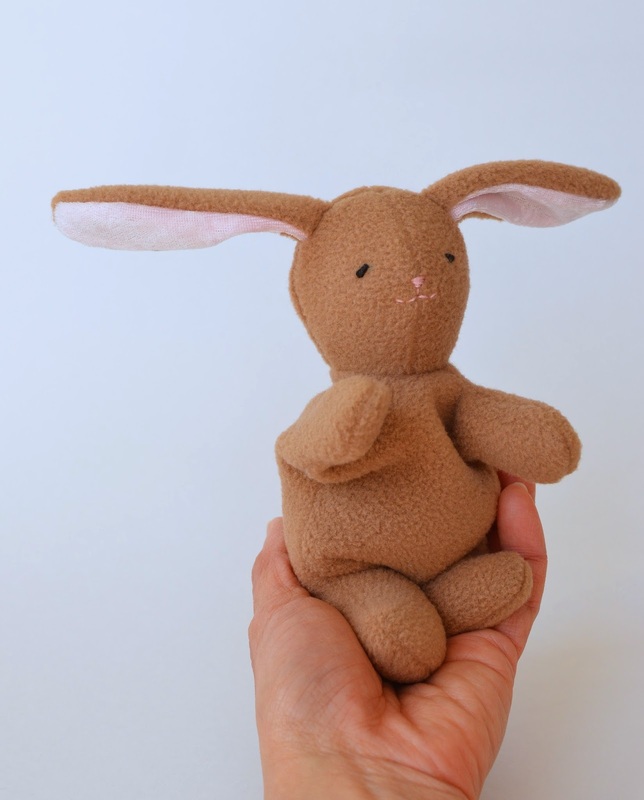 I'm sharing the tutorial for this little critter on Sew Mama Sew today! But, wait - the story's nowhere near over. These are children, remember. 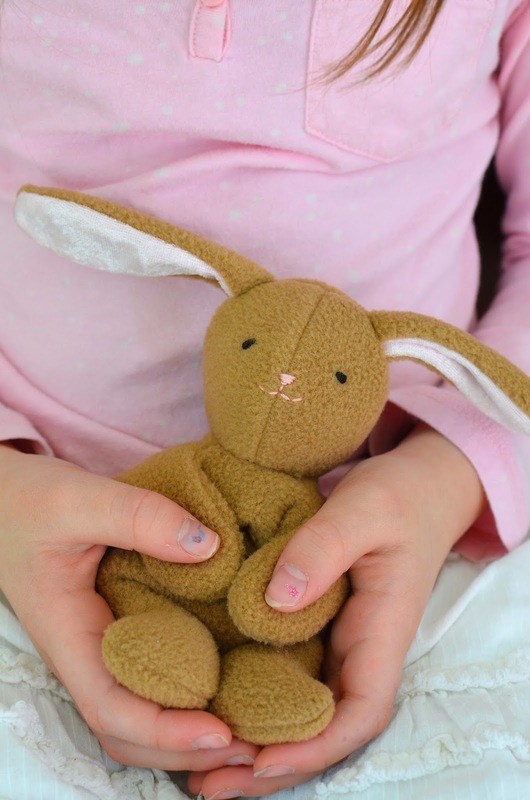 And a stuffed animal is never just a stuffed animal to a kid. The first thing that happened was food. 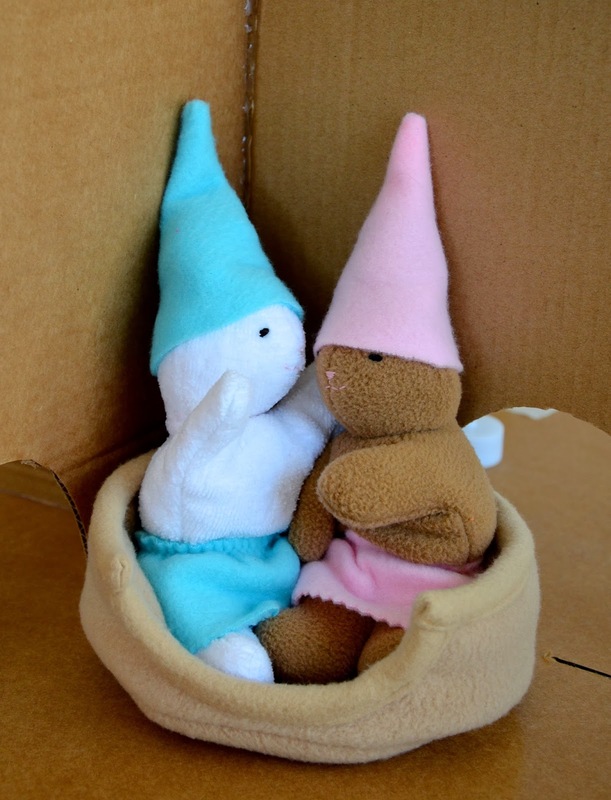 The baby bunnies, having been "just born", were starving, the children said. 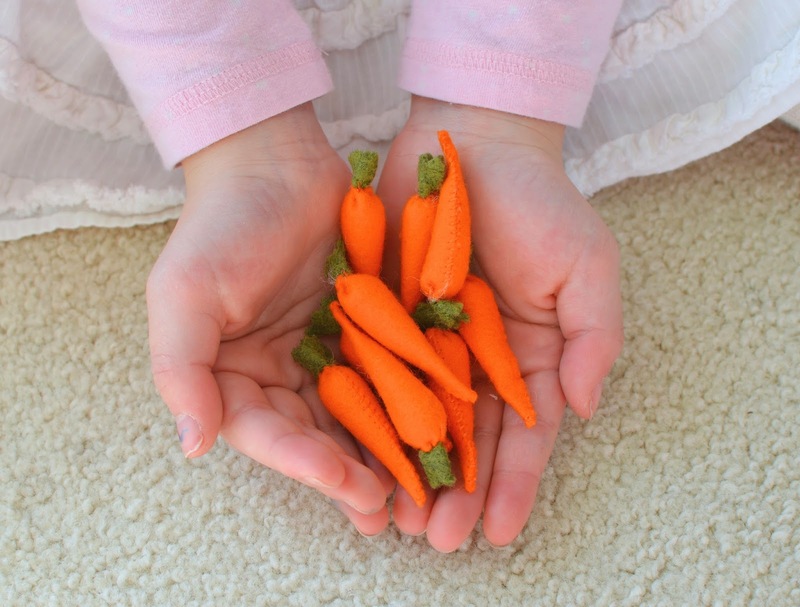 So I had to make small carrots. 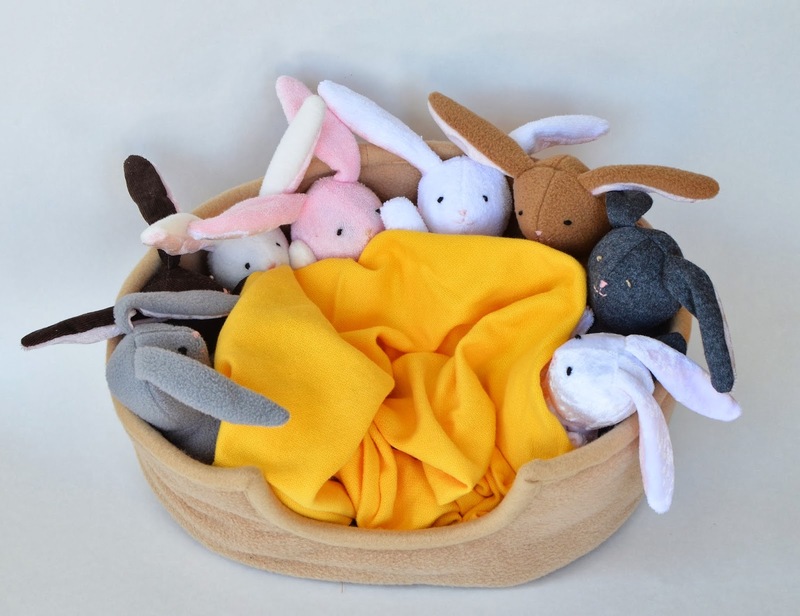 Then the bunnies needed a place to sleep, the kids continued. Could I please make a bed? Okay. Not like there's anything really important to do in the wintertime, anyway. What about the other seven bunnies, Mom? They need beds, too. Can you make seven more beds? Scream. No. Let's cheat and make a large, community bed instead. Awww. Look at those teeny paws. 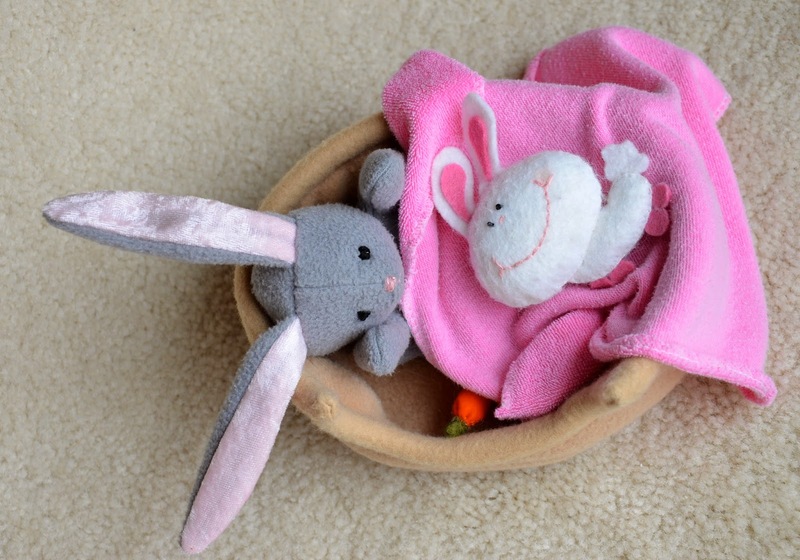 Bunnies are so sweet when they're asleep. Not unlike kids. And they're somewhat crazy when they're awake. Again, not unlike kids. 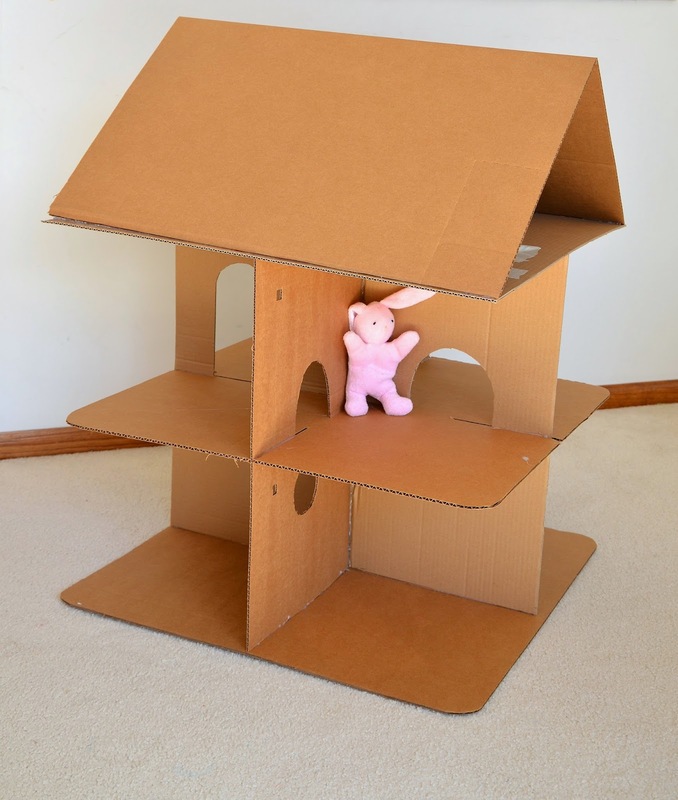 Then, Kate decided that the bunnies needed to move house. And they needed bags to carry all their important stuff. 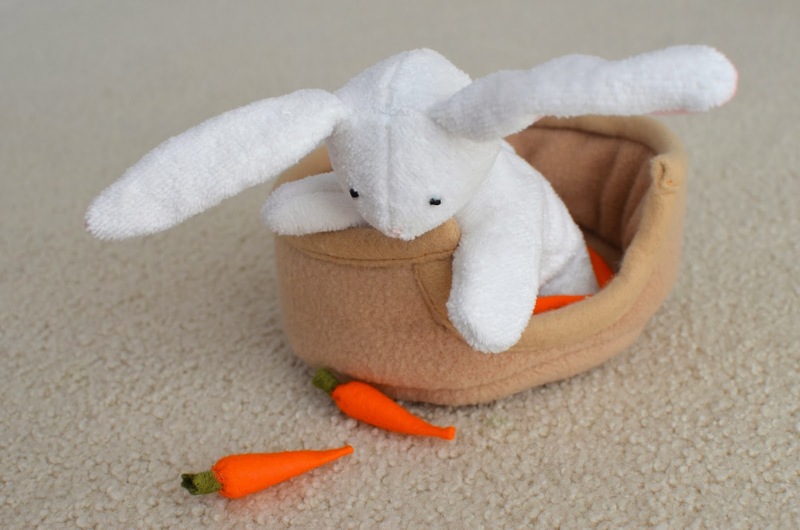 So one afternoon, we made bunny totes. And the new house they're moving into. A bunny with her bunny. Only a kid would think of it. when these kids are all grown up. And it put all that exhaustion into context. And made it worth it. 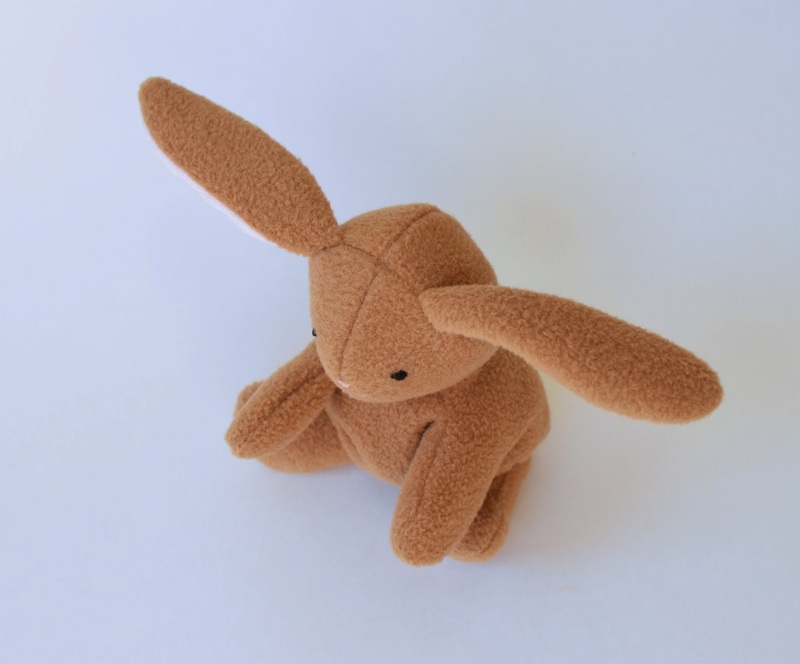 Tutorials for the various manic bunny accessories coming up next. 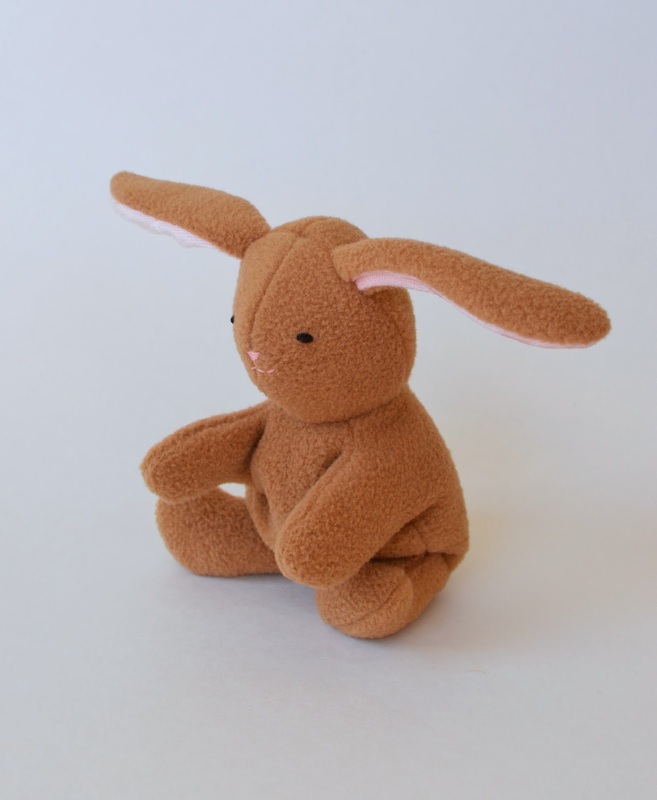 In the meantime, go make some bunnies at Sew Mama Sew! Soooo cute! Thanks for sharing! That is an amazing effort. 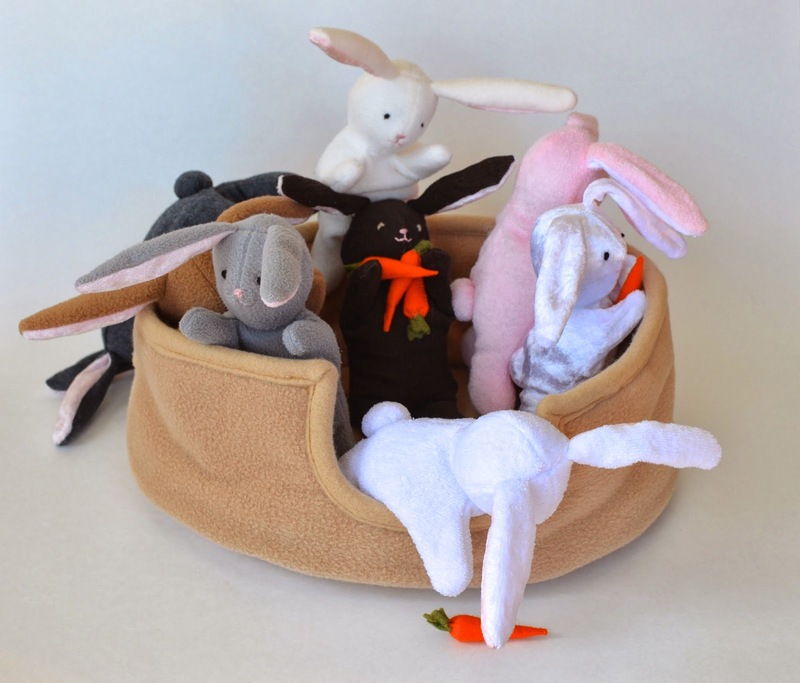 Those bunny beds are totally adorable. This is ADORABLE. 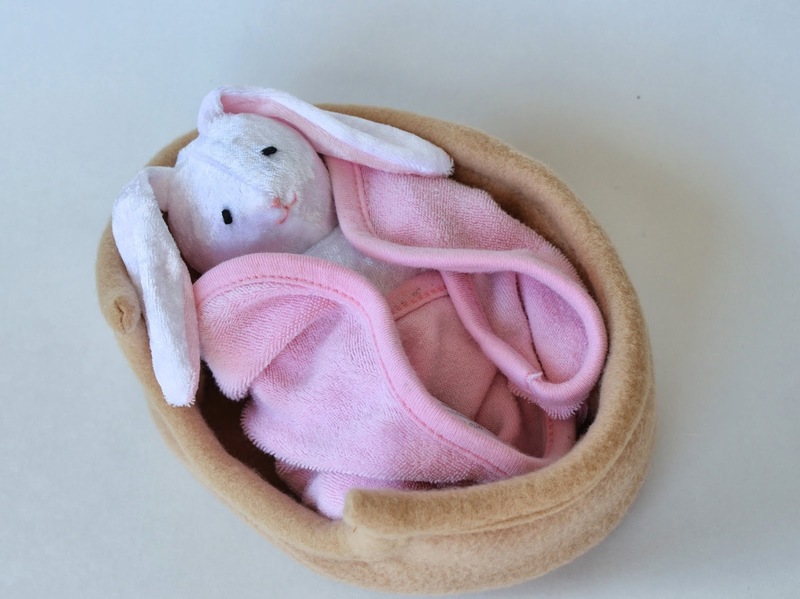 I know what my little granddaughters are getting for Easter. Thank you so much! These bunnies are so cute! 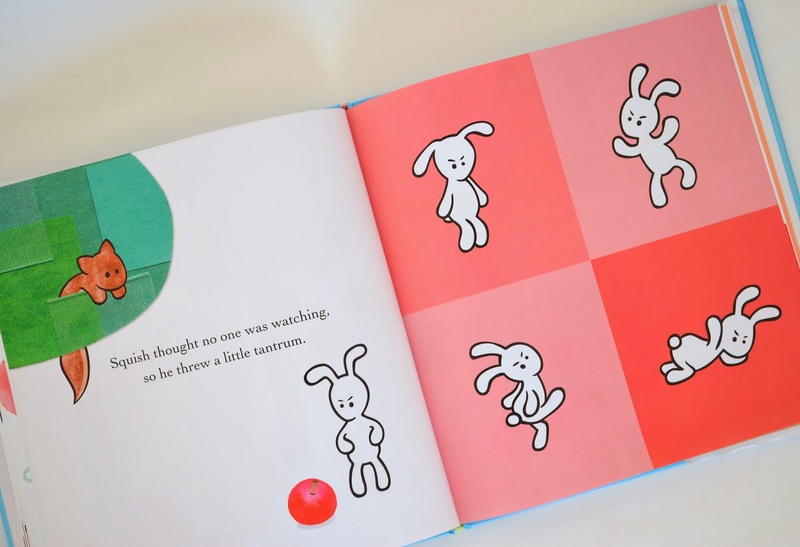 But the best part is the bunny's bunny, kids are indeed marvelous. 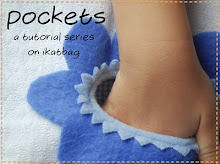 Thank you for sharing this, I am going to make a couple of these (when I'm done with my apron mass-production, that is). 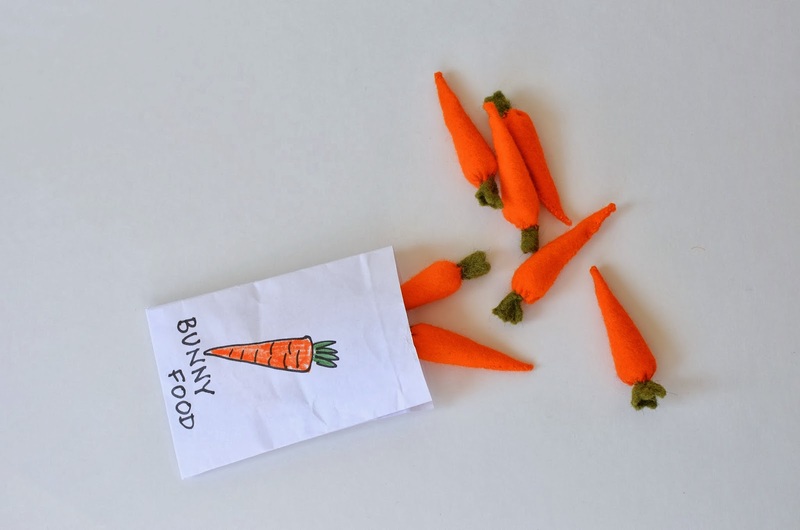 I look forward for the following tutorials (one cannot let his/her baby bunnies starve, right?). Love love love your bunnies. Ah well, kids will be kids! She has lovely imagination play ideas! wow! some major bunny love! as usual your work is beautiful. 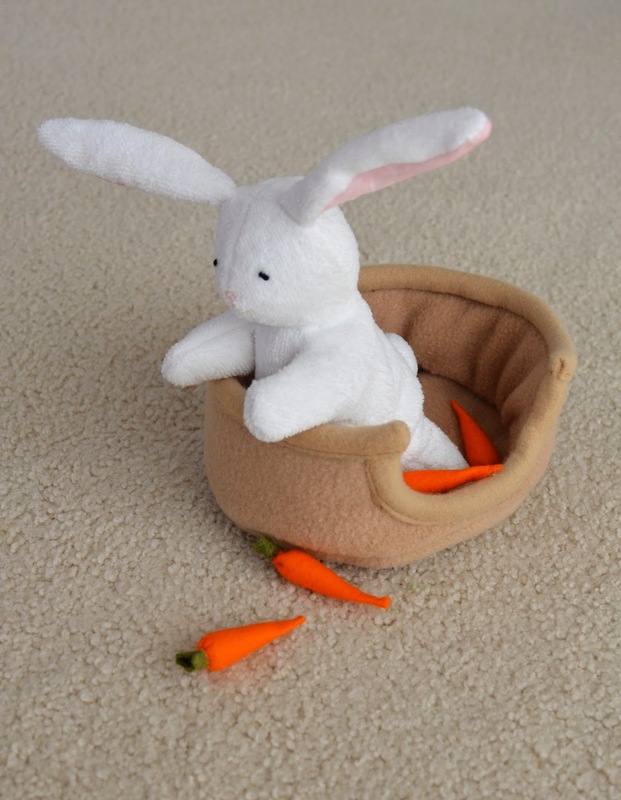 I am sure we will be making bunnies and carrots and more this week end. [sigh]... Coming out of lurkdom to let you know that you are my hero. 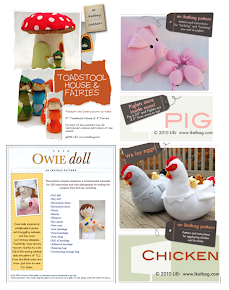 I may never get around to making all the things from your blog that you've inspired, but I enjoy reading about it. Thank you for writing, sharing and being so creative. You are awesome! Oh, they are so cute! 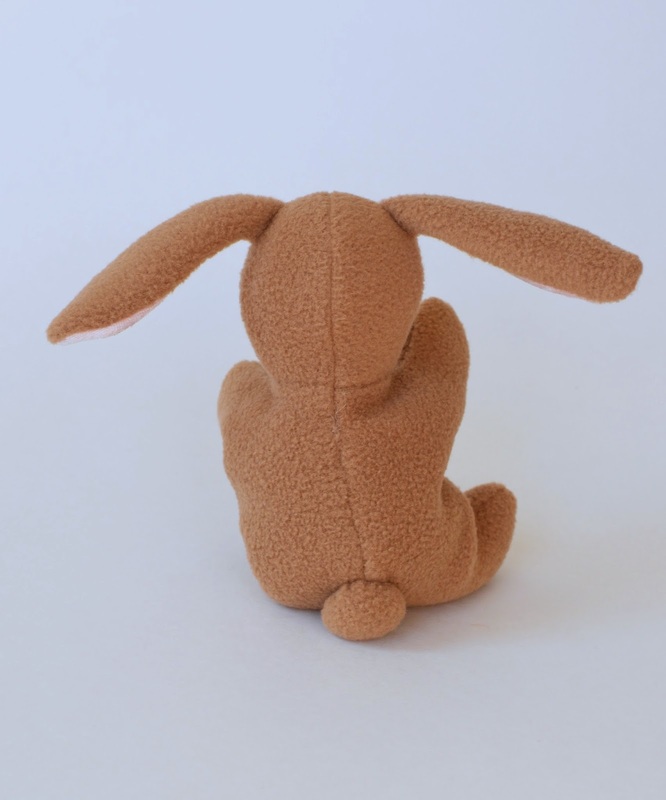 Especially that picture from the back, with the little front paws extended. I just love these bunnies!! I am going to run to the store so I can get supplies and get started!! GG: Maybe because not all kids are as manic as mine? 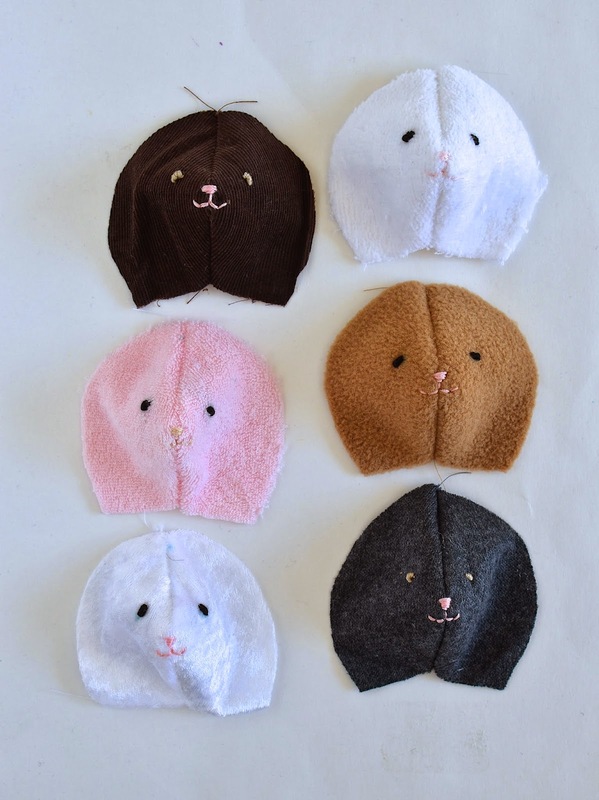 Thank you for the tutorial for these charming bunnies. As you know ,I was hoping that you would. I have been eagerly reading your blog in the interim and seen some amazing projects. You are an inspirational sewer. I am so eager to start these but they will have to wait until I return home from Hong Kong. 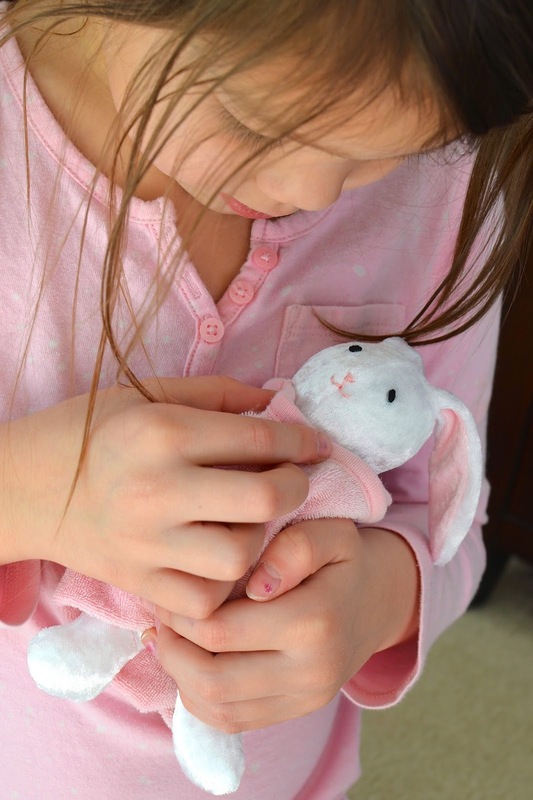 I am visiting one granddaughter now and she will have to get her bunny in the mail. Thank you so very much! Love these bunnies. 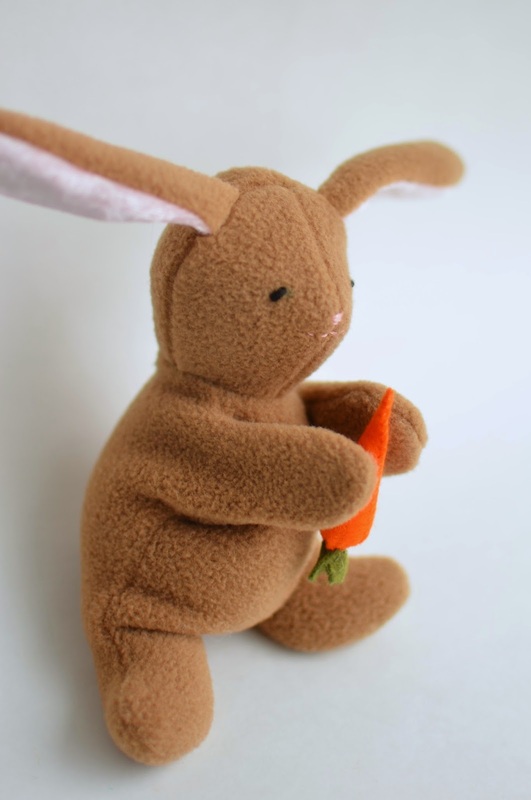 I want to make some for my children for easter. Sweet! I want one for myself never mind my kids. You are such a good mommy. These are wonderful... thank you so much for sharing your hard work... my girls thank you too! So darling; I love that they are two kinds of bunnies in one! good grief you are so creative and talented. And you're making wonderful memories for your children. A great Mom indeed. My heart just melted reading this post. I have a bunny lover in my home too. Ann: Ack. Sorry I haven't replied till now. We were all busy getting over jet lag after our trip home. Hardest fabric to sew = the corduroy. Very stiff, even though I used baby wale (the softest, thinnest corduroy). 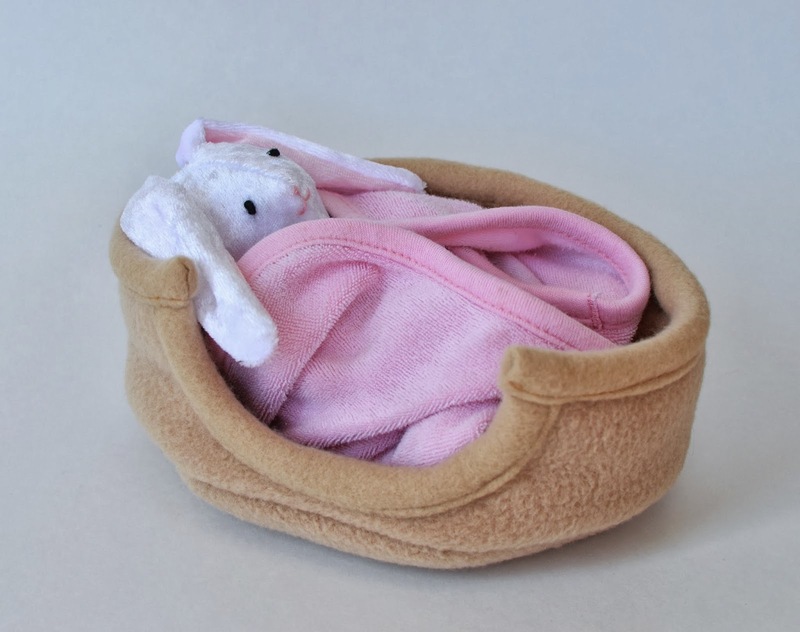 Easiest = microfleece. 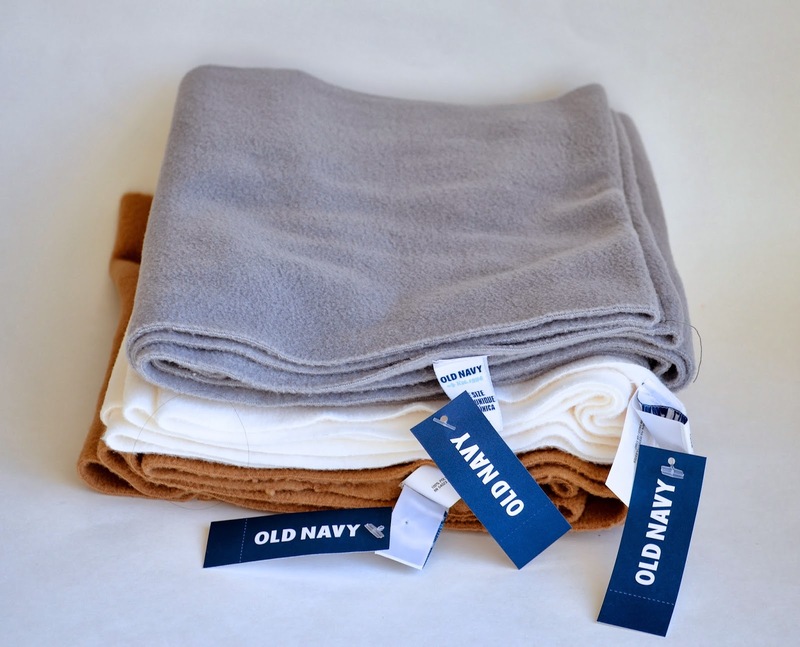 Soft like fleece, but thinner, doesn't need a special knit needle (although if you used one, it wouldn't hurt) and easy to manipulate. The jersey knit and stretch terry were easy, too. 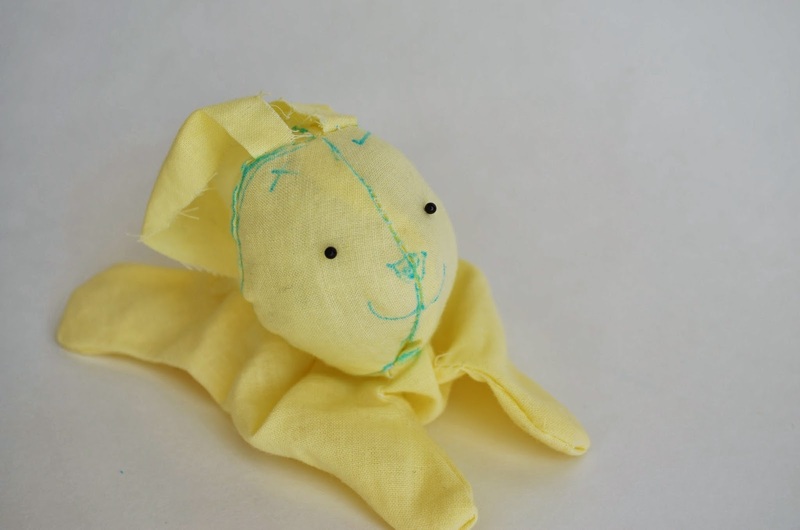 Just use a ball-point needle and it will feel like sewing regular cotton.